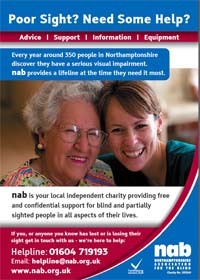 If you aren’t aware of the work of the NAB you can find out more from the NAB Awareness Poster or from their web site. As well as the visit of the Mobile Sight Centre to Daventry in July, there are other monthly visits in August and the continuation of Ball by Ball facility, in August, for partially sighted cricket enthusiasts at the Northants County Cricket Ground. In May the NAB’s Sight Centre in Kettering was opened by Lesley Joseph. You can find out more here or get the details in this poster. NAB are also appealing for volunteers to support the gardening appeal at the Darsdale Centrele in Raunds. This entry was posted in Events, Volunteering and tagged Northants. Bookmark the permalink.